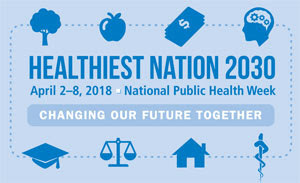 April 2-8, 2018 marked National Public Health Week (NPHW), themed "Healthiest Nation 2030: Changing Our Future Together". This year, the National Nursing Network Organization was honored to receive a letter on behalf of the National Public Health Association, inviting this organization to officially become a NPHW partner. In his keynote address to mark the occasion, U.S. Surgeon General Jerome Adams noted “I believe with every fiber of my being that every American deserves to live a long and healthy life.” View Dr. Adams’ remarks, and other public health speeches here. To maximize the health of all Americans, Dr. Adams emphasized the need to address such public health crises as the opioid epidemic, the effects of adverse childhood events, obesity, mental illness, and health inequity. To address such complex public health challenges, Adams stressed the importance of enhanced partnerships. 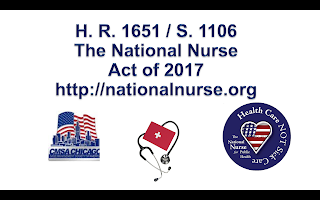 A National Nurse of Public Health would represent collaboration between nursing, additional health professionals and policy experts to elevate health for all. Each day of public health week highlighted a key public health topic, including improved mental health services, communicable disease prevention, health of the environment, community violence prevention, and health equity. Join the American Public Health Association and the NNNO to celebrate and improve the health of every American. You can find great tools and tips for advocacy through the American Public Health Association.